Used pair of Optimus Pro LX-10 speakers for sale, big brother to the LX-5. Two way ported system design with twin 7" woofers and the Linaeum film tweeter on top. Tested using a signal generator (usable to about 52Hz on the bottom end) and also extended listening. 2 Realistic OPTIMUS T-120 5 1/4" POLYPROPYLENE CONE MIDRANGE SPEAKERS 40-1031 8 OHMS RADIO SHACK 80W. 2" by 4" Linaeum dipole tweeter. Speakers are in perfect working condition and sound great! Frequency range: 85Hz–20kHz (no limits given). Any accessories, cables, or parts, if included, will be shown. Works great and sounds good. All cables and power supplies you need are included. Speakers are a little dusty. 9" tall x 5.5" wide x 5.5" deep. STEREO Speakers Optimus Pro 7 White 40-2065 Bookshelf 50 WATTS. Sound great. These are used and sound great. Pair of Pro-X55AV Optimus Bookshelf Stereo Speakers Monitor White Tested! Works! 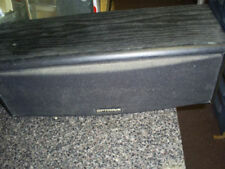 OPTIMUS STS-100 STEREO SPEAKERS IN VERY GOOD USED WORKING CONDITION AS PICTURED. Optimus STS 620 speakers, kept in excellent condition. These are great 2-way speakers 50w maximun 100w.don't miss these. Late 1980s or early 1990's bookshelf speaker pair. 4" woofer. Work well. Speakers only, no wires. Maximum Power 80 W.
Images are of LX5 Speakers. Tested and working. Optimus front emblem paint loss (IMG1). Matching: 12A5. Bottom (IMG10). Back, paint drop. OPTIMUS PRO X7 Speakers: Excellent Condition. These OPTIMUS PRO X7's are in excellent condition, and work great. The grills are flawless, and all of the mounting pegs are accounted for. These little speakers sound amazing alone, or even better with a 10" Subwoofer. Up for sale is a pair of Optimus Pro-LX5 II Bookshelf Speaker. It has been tested and is working properly. No accessories. See pictures for more details! Physical Condition:Fair. Working Condition:Tested and Working. Tested speaker missing the front logo and chip of paint left upper corner. Speaker sounds good tweeter working no rattles or distortion spring wire clips good. couple small scratches on side. You'll be astonished by the realism it adds to movie sound effects and the dynamism it lends to all kinds of music. The speaker cabinet is solid in construction and is finished in genuine black wood grain vinyl. OPTIMUS PRO CS-3 2-WAY CENTER SPEAKER!! 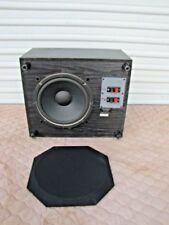 This is a nice sounding center speaker.It is in overall good condition and works perfectly. God bless! Optimus Pro Cs-3 Center Channel Surround Sound Speaker. Condition is Used. Works great. Should work as a center channel in any setup. Hooks up to positive/negative wire. See pictures. TESTED SOUNDS GREAT OUTDOOR SPEAKERS OR INDOOR SEEMS TO BE POWER COATED HAS HOOK ON BACK FOR EASY INSTALL GREAT FOR PATIO. GREAT SOUND. 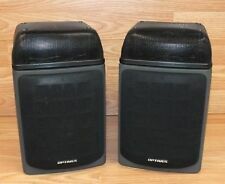 (2) OPTIMUS 5.25" SPEAKERS (MADE FOR RADIO SHACK), 8 OHM IMPEDANCE, POWER HANDLING 40 WATT, MAX 80 WATT. USED BUT BOTH IN VERY GOOD CONDITION EXCEPT ONE HAS A VERY SMALL DING IN THE CENTER CONE WHICH HAS NO EFFECT ON PERFORMANCE. Optimus STS-620 bookshelf speakers, 2-way. Condition is Used. Pretty good shape, tested and they sound good but due to age being sold as is, no returns. The connectors are spring-loaded and accept only stripped wire ends. Also on the back panel is a fitting for wall-mounting the speaker. Recently we have been testing out the bulk/wholesale market. Condition Notes: Good Tested Condition. Woodgrain cabinet, is 18.5" tall, 10" wide and 7" deep,in excellent pre-owned condition. Bi- Directions Speakers. Model: 40-4055. New in boxes. Outer boxes are a little weathered from storage. 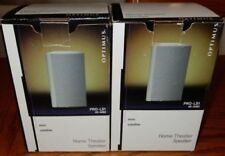 Very nice white 2-way speakers from radio shack Very solid small speakers Includes solid metal brackets that are adjustable so you can mount them on the wall. 15 watts continuous 30 Watts maximum As you can see in the pictures there are scratches here or there but nothing major. The grill and the badges look very good. They are about 6 and 1/2 in tall 4 in wide and 4 inches deep. From a smoke-free home. Thank you. Optimus Pro Series 12" speaker pair CSW 1200 - 200 watts rated. 3.8 ohms (both) tested with signal generator. 2", modified to fit into the Advent cabinet. Great shape, surrounds are in excellent shape. Good Tested Condition (see pics). You will receive what is listed or what is in the pictures unless noted otherwise. Nice set of lightly used Optimus Pro X5 bookshelf speakers. Optimus PRO X5 Speakers (2) 30w Radio Shack 40-2070 . Condition is Used. Shipped with USPS Priority Mail. Optimus Pro X5 Bookshelf Speakers! (30W) Great working condition Has signs of use Ready to ship! Optimus Pro 7AV black stereo speakers- I have had these speakers for several years and have used them mostly in the garage. They make great speakers for the garage with very good sound and they are built like a tank! OPTIMUS SWS-502 140 WATT 10 INCH SUBWOOFER!! This is an old school passive sub that sounds great when you hook it up to an amp. It is in overall good condition and works great! God bless! Optimus PRO 7 - Indoor/Outdoor Die Cast Bookshelf Speakers - Catalog # (40-2065). These speakers can be used Indoor or Outdoor. Designed in Texas. Made in Malaysia. Gold banana wire connectors. Dual bass reflex ports. Nice looking. Very smooth sound. Used… Tested…Excellent sound. New surround foams. Wall mount includes (as shown in the photos). Optimus Bookshelf Bass reflex speaker in perfect working condition. Pair (2) Optimus Pro 7AV 40-2059 Bookshelf Satellite 8 Ohms Speakers.